Scissors Crossing (Mile 77) to campsite above 3rd Gate cache (mile 94). Seano and Dionysus (Chris) under the protection of those fab umbrellas. Charles here and this is just a quick note. We are behind in our journaling but these days are so full of hard work and stunning beauty ... No amount of journaling would do this justice. My feet better. We get through. 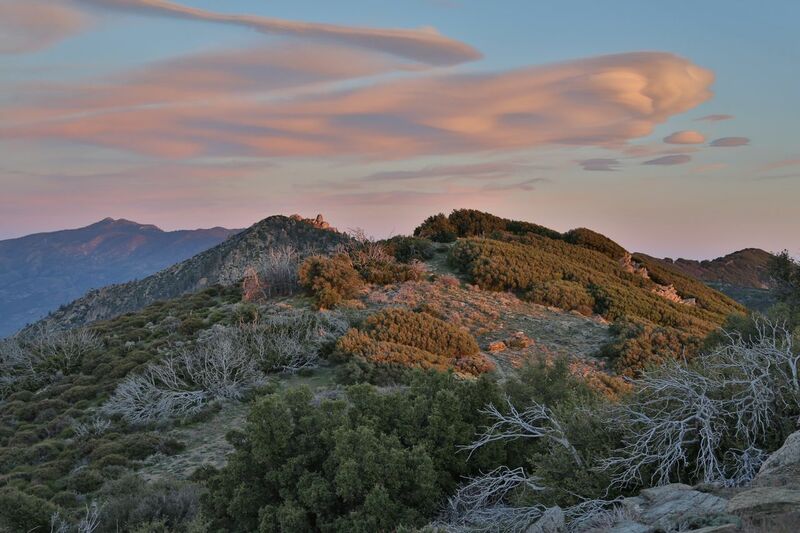 Amazing terrain today in the arid San Felipe mountains. Cactus all in bloom. Beautiful, beautiful, beautiful. Blooming prickly pear, beaver tail, chollo, ocotillo (not a cactus), many agaves in chartreuse bloom (also not cactus), etc. A Martian landscape full of strange alien lifeforms we marvel at. 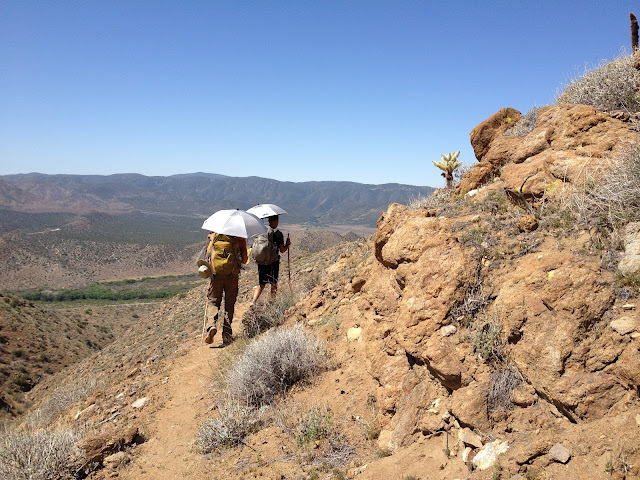 Our ultra lite reflective parasols allow us to move through the day's heat with much less wear and tear (it seems to us) than the many hikers who do not have them. But the San Felipes treat us well. There's Scissors Crossing & the bridge we slept under before ADZPCTKO. Those are the desert mountains we came down, the valley we have crossed, and we're heading up the other side. Charles (Pan) and Chris (Dionysus) under reflective umbrellas. We climbed higher up out of the arid mountains on the far side of the San Felipes to where chaparral took over the landscape. Charles & Seano refilling our water bottles from the cache. Thank you Trail Angels!! Here at the Third Gate Cache we met Christine and Louisa, German graduate art students. (They will wind in and out of our travels for the next 650 miles, as it turns out). We hiked a few miles higher into the chaparral -- and not far from where Tina and Louisa were camped, we cleared room in the dense manzanita scrub for a cowboy camp under the stars. The wind roared like crazy!